Tomorrow is Remembrance Sunday in the UK. My contribution in tribute to the dead is cynical and repetitive, reflecting, I hope, war itself. The four ‘O’s’ in the last line are meant to represent…machine gun fire! Millions costing pennies that paid dearly for their death. Lives costing nothing to be thrown to rest. Scattered parts of bodies that would have been left to lay. With no lasting memory of the cost they did pay. Red flows their blood and paints the poppies so bright. Generations lost forever with no remembrance light. Those that cared left grieving, was their cost to pay. Over unforgotten hearts that could have been left to lay. We salute the dead and pay homage to their cost. But where now lies the soul of war as everyday more are lost. The dead have no memory but it’s them that pay. While the heart of man pays respect on only one obligatory day. 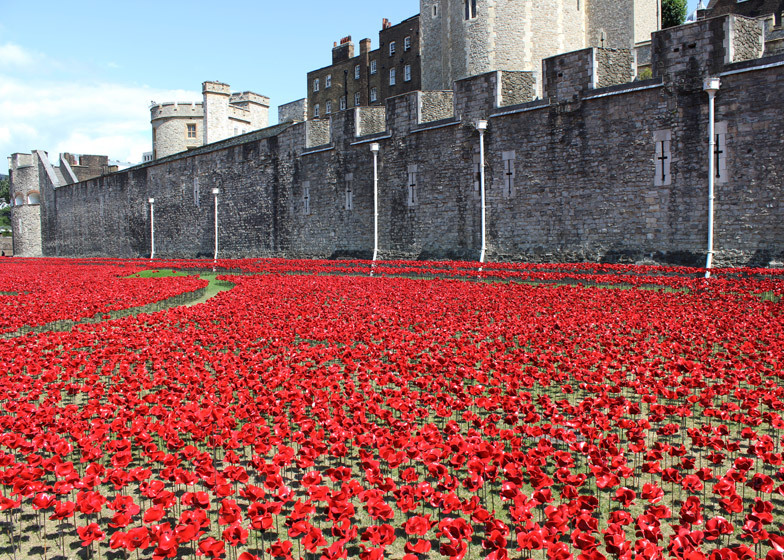 This entry was posted in Author/Writer, Raconteur and tagged BBC, Danny Kemp, London, poppies, remembrance, Tower. Bookmark the permalink. From the air, it looked like a river of blood. It made me think. Shame it all had to be removed.